Who has never spent an evening with friends or family around a fire on a beautiful summer night? The Outdoor Room trends are changing, but fireplaces and fire pits will always be a safe bet for all those moments they enhance so well. Here are several models from which you can choose to create more of these lasting memories. Outdoor gas fireplaces provide very similar benefits to their indoor counterparts. Not only they do not require a chimney, but you can control the flames to your liking and turn your fireplace on and off remotely. Two-Sided Fireplaces-If your space is more defined and complete, or even akin to an extension of your home, options available are similar to those aimed to be installed inside a house. A See-through fireplace will allow you to enjoy the fire from inside the house as well as from the Outdoor Room. A Single sided Fireplace can also be a very good option providing heat and comfort in your Outdoor Room. Torch Fireplace-Providing up to 6,000 BTU, Torch Fireplaces create a flame aimed more for aesthetic than heating purposes. Zero-clearance and not requiring a chimney (as they are vent-free), they will easily fit in your garden or terrace's small spaces for instance. 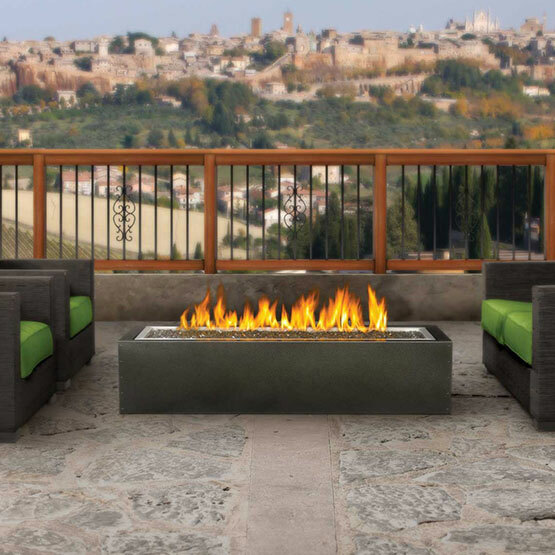 Linear Fire Tables-With Elongated shape, glass ember bed, and can be embedded in furniture or tables, this type of appliance is a middle ground between indoor and outdoor gas fireplace. It fits well with wood, stone or brick terraces. Patio Heaters-Although these may look like floor lamps or torchieres make no mistake, and they do heat up! Several models are designed with wheels to move around easily. 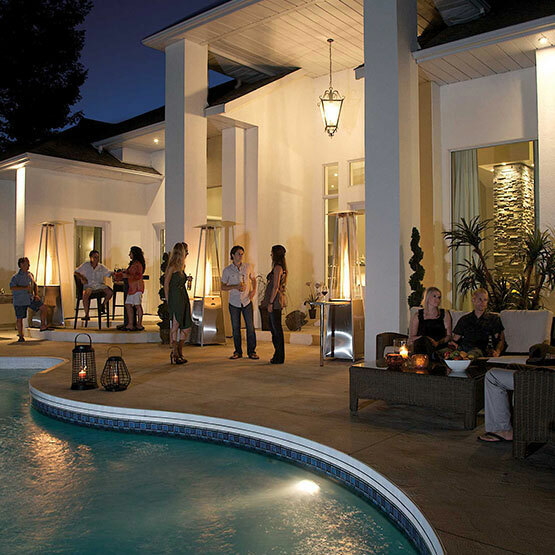 Patio heaters are convenient in summer, but even more during spring and autumn. Finally, they can meet several BTU needs, with some of them providing 10,000 BTU, and others up to 40,000. Water and Fire Together-If you would like to enjoy both the relaxing effect of water and fire, look at Hearth Product Control (HPC). The manufacturer has designed two stunning fire pits that combine both fire and water, enhanced with LED lights to illuminate the water feature. Despite being highly decorative, the set generates substantial heat with a gorgeous 65,000 BTU gas fire. Outdoor spaces and electric fireplaces are rarely associated together. Yet, there are now several models that can perfectly fit in your backyard. They provide most of their indoor counterparts’ advantages as many of them have been designed for both inside and outside. So, if you hate maintenance, enjoy convenience, and need few BTUs, outdoor electric fireplaces represent an attractive option. Do you love the smell of the wood and its crackling? Several types of fireplaces are available, but one model is particularly versatile. Made of volcanic stone, it can serve as both a fireplace and a barbecue with which you can cook food on a grid as well as on a cast iron plate.